WOW. These were really awesome! I didn’t even eat them with anything, just plain by themselves. Yum! The texture was fantastic and the taste was terrific. I’m pretty sure that I could get my omnivore family to enjoy these. I â™¥ these sooooo much! I served them over Quinoa gluten free spaghetti with marinara sauce. I had seconds and then thirds later. Josh, you combine the perfect blend of seasonings. The soy sauce, chili powders, mustard, and vinegar give them a smoky flavor. This recipe is definitely a keeper! They should be like little meatloaves wrapped in cabbage… Any ideas? Hi S. Sussman – Toni Fiore of Delicious TV has a recipe that will probably work for you. It’s not on her website but I can type out the recipe for you if you would like…. these were great. they were spicy – i would like to use this recipe for a delish burger patty (i always mix my own spices ie. chili powder) so i think for spaghetti i will sub the chili powder for basil, oregano and thyme to give it that more Italian flavor. i love your recipes. i am not actually vegan but my digestive system is so it is nice to have some tasty recipes to make it happy. These look great I will try them later. However, I think it is because I am British, but what is “isolated soy free” ? Is it a type of soya? I have been a vegan for 15 years and it is the first time I have seen this. Or is this a language issue? I would like to know how they would hold up in a soup. My thinking is to cook the soup first then warm up the meatballs and add just before serving. Should I worry that they will fall apart? Maria, that sounds yummy if it will work. I’m kind of thinking that the meatballs will become too moist but I could be wrong. If you try it post what your results were here. Hey josh, thank you for your great recipes. is it possible to make these using 1 cup lentils, 1/2 brown rice? Danielle, not sure that would work but you can try. It may make them too wet. Ok. 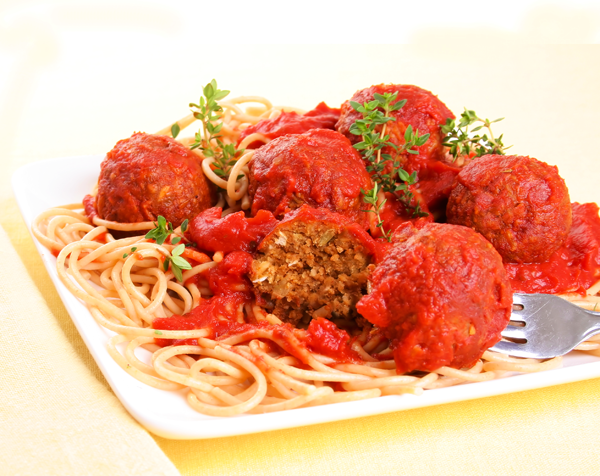 I can’t believe how delicious these meatballs are. Soooo much flavor! I wanted to follow this recipe precisely but I have gluten sensitivities. For those who may be interested, I subbed ground flax seed for wheat germ and potato flour for wheat flour. I ate them plain to sneak a taste. Makes a great burger when smashed flat. I will be having them later with Swedish meatball sauce over rice. Mmmm. Thankyou for this recipe! I made these for a party last Friday night that was full of meat eaters. I put them in a crockpot with barbecue sauce on them. They thought they were hamburger! One of my friends who knew the truth kept saying to people, “Aren’t they fantastic? Isn’t that meat great?” It was hysterical. Thanks for a great recipe! Fairy Tale, would love to have a fly on the wall for that lol. You should have done a hidden camera thing and posted it on youtube. Oh my….just finished making these…my first attempt at a vegan non-meat product and they are FANTASTIC!!! My meat eating husband opened the oven door as they were baking and said with a very audibly puzzled voice, “Hey, these don’t smell bad!! !” I couldn’t wait for dinner, had to try one, and it was absolutely delicious!!! Very exciting!!!!!!!! Maybe I did something wrong but these tasted horrible to me!! Not sure what happened, I did cook them in the skillet with coconut oil instead of baking them, so maybe that happened something to do with it. michelle, maybe your coconut oil is rancid? Maybe you left something out by accident? Happens to the best of us. These are well-loved in my house. We’ve even started putting it by messy spoonfuls out on a baking sheet and baking it, then mixing it in (at the last minute) like ground meat. So far, we’ve loved it in hamburger casserole, sloppy joes, tacos… What to say? You’re a master! Thanks! AmyB, I too have started making ground meat for tacos and stuff with the meatballs, it totally works. Glad to see someone else has thought of that idea. I came across your recipe and I’m very excited to give them a try, but I was wondering if there is something I can substitute for oil I am vegan and I avoid all oils in recipes? I don’t know anything that can take the place of oil. You could try leaving the oil out. That could make them really dry so maybe try steaming them after they’re baked in the oven. You may want to look into using Coconut Oil instead. It maintains its healthy benefits even when heated. I order mine from tropicaltraditions.com – Coconut oil is not man made and has a vast array of great benefits. Happy cooking! These look great! If I wanted to freeze, would I bake first or not? Katie, Cook them first, then freeze, they freeze wonderfully. Can I use any color Lentils? What can I substitute the Wheat Germ with? Could I increase the Brown Rice, Oats or Wheat Flour to compensate for the Wheat Germ? Or can I just leave it out? I think any color lentils should work, but for the record I used brown common lentils. I would substitute wheat germ with almond meal/flour or brown rice flour and that should work fine.